Stephen Lord spent the first twelve years of his working life as a banker in the City and has lived and worked in London, Japan and the USA. He has travelled widely over the last fifteen years, either on his bicycle, by canoe or on foot. He has walked several of the French pilgrimage routes and the Via de la Plata in Spain and updated Trailblazer’s Trekking in the Pyrenees. His long-distance cycling expeditions have included London to Athens, Alaska to Mexico and numerous shorter trips in Japan, India and other parts of Asia. 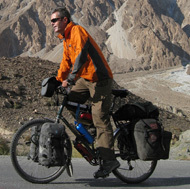 Stephen wrote the Adventure Cycle-Touring Handbook which has become the definitive guide to planning a cycling trip. It was updated for its third edition by Harriet and Neil Pike.